Did you know that God wants to give you amazing, wild, million-dollar ideas and witty inventions? God is a radical God. He loves to answer radical prayers. His Word is full of radical promises you can claim so you can see His radical answers. We already talked about how wild it is that God wants to honor you, and that Jesus became poor so you could become rich. 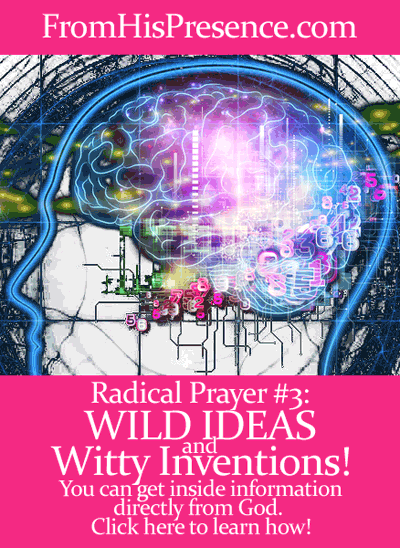 Today, we’re going to talk about how God wants to give you wild ideas and witty inventions. God didn’t say in Jeremiah 33:3 that He would DO great and mighty things. He said He would SHOW ME great and mighty things. “Showing me” something refers to God teaching or revealing something I didn’t KNOW before. The Hebrew word here for “show” means to tell, make known, declare, announce, report, and inform of. So God is talking about telling me new things I didn’t know. He’s talking about conveying knowledge and ideas here. He’s talking about expanding my current reality. He could give me totally new ideas about my business. He could show me how to better teach my LifeGroups at church. He could show me how to manage my home, my marriage, my friendships, etc. He could tell me about things that are currently not even part of my reality. After all, God is into giving His people million-dollar ideas and witty inventions. Mendeleyev created the periodic table from a dream. Frederick A. von Kekule solved the structural riddle of the benzene molecule (a closed carbon ring) from a dream in which he saw a snake seizing its own tail. Frederick Banting isolated insulin with help from his dream. Elias Howe finished his lock-stitch sewing machine from a dream. The inventor of the compound bow received the idea for the invention in a dream. Einstein’s theory of relativity was inspired by a dream. The last movement of Handel’s Messiah was given to Handel in a dream. I think you get the picture. God is full of good ideas. All good ideas come from God, and He loves to give His people witty inventions. That means He wants to give YOU witty inventions and wild ideas too. But here is the biggest key: God wants to surprise us. He said the things He will show us are things we do NOT already know. That means it’s not possible for us to anticipate exactly what He wants to show us, because the new things He wants to show us are totally outside our current reality. When I started praying that prayer, awesome things started happening. Business ideas. You’re going to see one of them in a huge announcement I have next week, and it’s awesome. Ministry ideas. Part of the huge announcement next week has to do with ministry. Discipleship ideas. He started showing me how to love people better, and how to help them through what they’re going through. Teaching ideas. He started giving me awesome illustrations that help people grab hold of His love for them. It’s just been wild. So I have continued praying this radical prayer, and God has continued to show me things. It’s uncanny that the answers have all been SHOWing me things, too. God has not been DOING the things for me; He’s been SHOWING me what to do. And I suppose, after all, that that must be better. After all, we don’t grow when He does it all for us. We grow when He guides us and we follow. So are you in the mood for some wild ideas and witty inventions? Do you want your Heavenly Father to show you great and mighty things that you do not know? Have you ever had a wild idea that you knew came from God? If so, please leave a comment below and tell me what happened! Image courtesy of Saad Faruque on Flickr. This post is linked up over at A Little R&R. I am a strength and conditioning coach and one day while using sleds to condition my football team I noticed that it was taking a really long time for the team to turn the sleds once they got to the desired yard marker and then brin it back to the starting point. I was getting really mad because it was a conditioning period and it was not moving fast enough for my liking. I prayed later that night and ask the Lord to give me and idea of a better, more functional sled. He did! I am now in the process of working on a deal with a company to manufacture it and sell it. I have also developed another piece of training equipment that is also going to be sold. I am also looking for people who have expierence in building apps because I have ideas for those as well. Anyone interested or knows anyone who builds apps please hit me up! That is so cool, David! Amazing! Thanks for sharing your story. I hope things go well with the manufacturing process! I have an idea for an app also but don’t know where to go to get this made. Help me Lord. show me where to look. I know this App can help many Christians deepen their awareness of connection with God. How exciting for you! Encourages me! I’ve been seeking God to bring about manifestation of some ideas I have felt like have come from him some in dreams…seems to be in a stahl. Getting direction…Thanks for sharing.. keep Prospering! I love your faith in God it really encouraged me to started praying God’s word . That’s awesome, Willetta, and thanks! I’m so glad to hear it encouraged you. Thank you for reading! Sometimes last year I was intensely s seeking God’s face for an idea that will add value to my generation,and a still voice spoke to my heart in a direction I never envisaged. God gave me a bible feature add-on that will help make navigating through His word easier and quicker. But the realities is that I don’t even know how to kick start this project. Please I need your advice and guidance. Hi Timothy, I’m sorry but I don’t know anything about that either. But just pray into it, don’t let go of the vision, and ask God to open doors, ok? HE knows all about it, so as you pray, He will help you. Thank you for reading, and thank you for sharing! Have a wonderful day! Hey there!! This is an amazing post. Thank you a bunch !! My witty invention – literally-came to me in a dream in 2005. And I even saw the website in big bold letters. NOONE has ever thought of this. I got up and drew it in a piece of napkin. But the sad thing is , I haven’t done slot at all with it. I had a NDE that left my body building , construction owner business body an invalid and legally blind. It was not my time they sent me back. I did see the beautiful white light. :). But I am asking from my heart that God will give me this second chance to do something wonderful with this WITTY INVENTION. I am now after 15 years, doing so much better. I have 20/15 vision now and can work again doing healing work , so I know I will be complete i…. Physically. Otherwise I know I am already. Thanks again for your posting this and all the other commenters too. Hi Peg. That’s an awesome testimony. I pray God would also open doors for you and help you take one step at a time as you follow His guidance! May you be blessed beyond measure! Thanks so much for reading, and thank you for sharing! Have a great day! God led me step by step through the entire process of building/creating a series of board games. I’m a writer. Not a developer… So you know it was a God thing. And the word for it came from the most unlikely place. He can and will make it happen. But we have to believe and be obedient to follow through. This post touched my heart. Thank you! Since I stumbled on your website, I have been visiting everyday from my small cubicle in Nigeria . God has blessed you with so much insight that it can only be grace . I am so blessed that the holyspirit led me to your site when i needed him most. I started with the radical prayer #4 and in 2 days , my thought system has changed so much that i dont understand…. I guess thats the power of letting go and showing God our helplessness…. God bless you. Wow, praise God. I’m so thankful He’s touching you through my site. Yes, everything good you see here is because of His grace. I had nothing without Him and then I met Him and He redeemed my life. I pray He would bless you also and raise you up closer to Himself as you seek Him. Thank you for saying hello! It’s nice to meet you! as I googled ‘ witty inventions, ‘ I found prov. 8:12 AND your site. Thank you. I’ve just prayed the Jer 33:3 prayer – and now am expecting wild money-making ideas. My dad was an entrepreneur and I know I have inherited that same spirit. I;m so glad I found your site. Amen! I pray our Heavenly Father would give you great wisdom as you put your hand to the plow! Thanks for reading! WOW, I so needed this!!!!!! God Bless you Jamie!!! Jeremiah 33:3! I have just been inspired, to hold unto Gods’ promises and not let go! I truly believe he will make his visions and purpose for my life known to me in Jesus name, Amen! It’s been an exciting day today…widely surfing the internet for an idea that would add quality to my ongoing PhD program. God just gave me an idea for my research that would not only improve the academic scope of my project, but could also make me an internationally sought-after innovator and also generate greater ideas on biofuel production plant currently being developed in the United States. It all started yesterday when a professor challenged me and said my project was shallow. I didn’t take offense, I swung into prayers. Then…the rest is story! God really gives ideas for witty inventions. 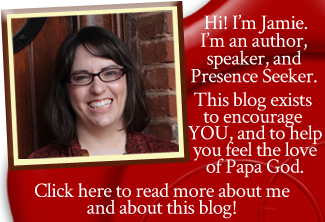 Thank you Jamie for teaching us the prayer keys to unlock that realm. That’s amazing, Samson. Go for it! I pray that you do become an internationally sought-after innovator! How wonderful. GOD can do this in you, through you, and for you. Thank you for reading my blog. 🙂 Have a wonderful day. Thank you for this great word of encouragement. Indeed God gives witty ideas and I can testify because i can relate to your story and for those who shared before me. Four years ago while working on my PhD, I got stuck as one of the my papers took a different direction from what was planned. I and my advisors came to a decision to drop this paper and begin a new one. I was so sad because the much time and energy invested. I sought God with all my heart, a few days after I got a dream. In a dream a man was talking to me and asked my why I had not considered a specific approach. When I woke up and thought about it, it made complete sense and when I shared the idea with my team they were all thrilled and in agreement that it was perfect. We fixed all that needed, we were able to complete and published this paper in no time. Glory to the our God! Dinah, that’s amazing. Thank you so much for sharing! Glory be to God indeed! I love how He downloads ideas and strategies and so much more! He still loves to create and is just looking for a listening ear–looking for someone who will listen to His ideas, wisdom, and inventions. Thank you Jamie for your words of encouragement and the gift that Jesus has trusted in you to touch nations. All the honour and Glory unto God. Thank you for making me realise that everything created by Jesus finds its purpose in him. God speaks to me in dreams and visions. Revealing that i will find diamonds and oil mixed with gold and in my country, he already showed me the places where and its at two different locations. I will be the first youngest male, with shares in BP oil company, God handed me the certificate with my name on “Jonathan” in the dream. I will start praying more like Daniel did and confess everyday. When Gods vision comes into existence, i would want to be a blessing unto to you Jamie, so that you can touch the younger generation. In the end everything belongs to God. I pray that Father would bless and prosper you exceedingly, Jonathan, and provide your every need. In Jesus’ name. May Good Lord Jesus Multiply your Gifts, Talents Around the World. I have dreams and visions, Jesus came me a name for a book. However I dont know how to write a book. Funny RT. Am so blessed reading this page for the first time in my searching experience, really it is the honour of kings to search out a matter concealed by God, You God put the answer to the questions of my heart in your write up!!! Oh mine, mine!! I bless God for His grace and wisdom upon your life. And am grateful to Him for leading me through this page. If this worked for you, i’ve got no doubt it’s going to work for me. May you be more richly bless with divine insight into God’s secrets and revelations. I love you with all my heart. Expect my testimony mail soonest. I’m so blessed coming across a page like this inn such a time i needed more than a prayer. I have been perturbed in my inner man what biblical invention could be that i desired to have one, in search of one. You are such a blessing to my world. I pray God rain you more revelations of His secret and enlarge your ministry and enpower you to finish the race in Jesus Christ name.Amen. Am sure going to send you a mail as I believe this truth is going to work for me the way it does work for you. Thanks alot for this post. Actually i feel touched by your article. Since i was young, I had always wanted to be an article writer. I prayed to God, and while in college i paid my school fees out of article writing. I would want to expand my idea international and work with everybody, In appreciation to our loving God. Thank you for sharing. Its been very liberating for me to understand that God hives ideas and inspiration for entrepreneurship. I will be praying that prayer. Yes! God is working with me now on an invention and it is becoming a reality. Glory to God! God spontaneously gave me an invention last year. It has passed the patent search with no prior art & The Lord led me to a business developer who is also an inventor that is a spirit-filled christian! Well, I’ll be 60 next year and I wonder……’Would GOD do such a thing as this for ME?’ I’m a believer in Christ, but I don’t have dreams or visions like many of the others on this post. Pray for me that GOD would show ‘ME’ great and mighty things that I would’ve never imagined AND give me the Grace and Wisdom to recognize/act when HE does. TODAY will be a starting point ‘marker’ for Me to start asking. Side Note: In Nov 2005, a visiting evangelist/prophet told me that GOD wanted to Bless me with my own business, but just having come through a divorce, I didn’t have the faith to believe something good like that could really happen. I distinctly remember he prayed over me for GOD to give me ‘witty & creative’ ideas. I never forgot it and that’s how I have landed on this post. I did a search in the Bible for the verse that speaks to that very thing. Maybe, just maybe…..NOW is the time for Me. ? Good morning!! I just love this! I so believe this with all my heart and been trying to get others to open their minds up to this truth. I am an inventor which is an added gift to being a Singer, songwriter, author, play write, advocate, poet, prayer writer etc. I see visions of cartoon characters for supernatural health,hope,healing,education and awareness. My 1st character “Cilly Cell” 4 Sickle Cell was created 8 years ago while I was homeless but I believed. 7 years later the costume came to life. In the 8 the year doors for the character to go places started opening but she made her 1st appearance in the 7 th year. I now have 10 characters and counting not to mention the ones I created and gave to others. God bless you richly!! I love your website and really enjoy your articles but I must say that the ad… the celeste, get your agel reading ad does not draw souls to God, but to an occultic entity. Your site should not contain such things, but only things that draw people to the like via ng God. A little flaw. Hi Adenike. I did not put that ad on there; ads generate automatically and feed differently for every person. So, I can’t see the ads other people see. I have tried to block all ads that are related to New Age and other inappropriate topics but sometimes one gets through. When that happens, please click the “report ad” button next to the ad itself and report it as objectionable. I cannot see these when they happen, so I would appreciate your help in this. I stumbled upon this websight a couple of days ago, signed up for the emails and today I have been praying about my next steps for my business. The Lord planted in me 2013, a small business, and it ended within a year. There is something inside me that will make something and be able to give God all the glory and represent Him well, to also provide for my family and ENJOY it! So today I googled Heavenly Businesses and I was brought back to the same place God sent me to the other day. Not coincidence. Thank you God! And thank you for this article! Incredible post! This morning in the middle of my work the Lord spoke to me Jer 33:3… for the last several years I have had dreams and visions I the area of investments that have often played out to the tee in some cases. Often I have doubted because it doesn’t make sense until it’s too late and blatantly obvious. Very often I’ve fallen into the trap of being satisfied with just seeing not actually doing anything about it, then getting frustrated. This post was such a confirmation and encouragement. God bless you. Going into radical prayer. Hi. I love your prayer series. They have been a great blessing. Thank you so much! I had a dream of a music app . In the dream my sister suggested that I do it a certain way that was very innovative. I believe that after the Sons of Issachar prayer and the witty inventions ,I will receive even greater visitations from God.